So much of our history has been sanitized to remove the Christian elements from historical accounts. A good example is the movie Braveheart, which depicted the life of William Wallace as portrayed by Mel Gibson. And although it was a beautifully shot film, with a rousing score, and plenty of action, it missed the true motivation behind the Christian faith of this larger than life character. 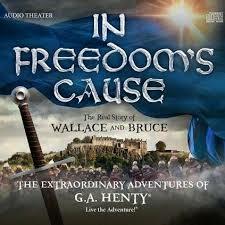 The team at Heirloom Audio Productions has decided to set the record straight by putting together their second audio drama, In Freedom’s Cause, complete with an inspiring script and a vibrant cast, bringing to life real story of William Wallace and Robert the Bruce. I had the pleasure of interviewing the executive producer of this project, Bill Heid, and discussed with him his motivation for audio theater, his selection of this story in particular, and the impact he hopes it will have on children, families, and those who wish to shape our country’s future in conformity to God’s law. The real story of William Wallace is one that teaches us that true freedom is worth fighting for.